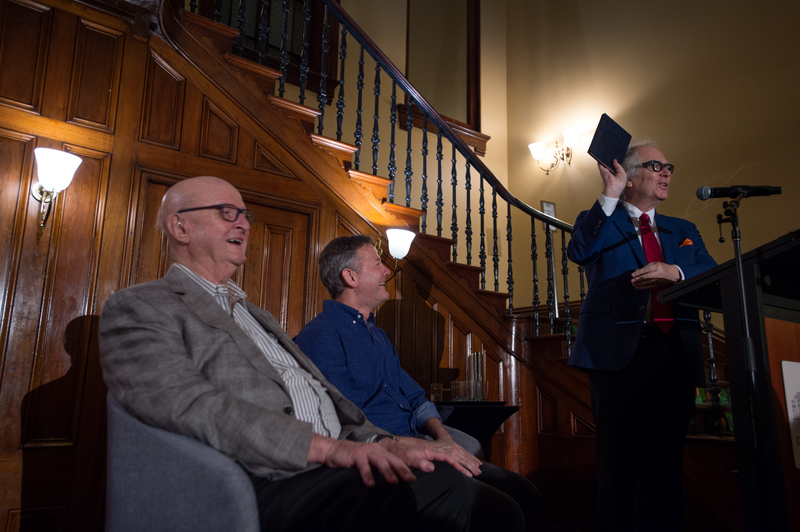 The life and career of one of Australia’s greatest living artists has been celebrated in a new book launched last week at Old Government House in the grounds of QUT’s Gardens Point campus. William Robinson: A new perspective, written by celebrated Brisbane author Nick Earls, was commissioned by The William Robinson Gallery, QUT. Its launch was held in tandem with the artist’s current exhibition - Nature Imagined – and included a reading from Earls with a response from the artist. The book, officially launched by Phil Brown, Arts Editor at The Courier Mail, chronicles the life and career of the renowned Australian painter. Now 82, Robinson has twice won the Archibald Prize for portraiture (Equestrian self-portrait in 1987 and Self-portrait with stunned mullet in 1995). Other accolades from his lengthy career include the Wynne Prize for Landscape in 1990 and 1996. Earls is better known for his fiction. He has written 26 books for adults, teenagers and children, including Zigzag Street, Bachelor Kisses, 48 Shades of Brown and Perfect Skin. This is his first major foray in the non-fiction genre and the first publication of its kind on Robinson. Its unique, beautifully-bound novella format emerged out of conversations between the two over a number of morning teas – previously they had never met. "As one of our most significant living artists, William Robinson's work has been the subject of numerous insightful essays and books by art experts," said Earls. Earls read the chapter from his book in which Robinson recalls his first Archibald Prize win and how he was viewed by the Sydney arts media as a country hick arriving in the big smoke more concerned with milking his goats than anything else. The book is available in-store and online at the QUT Bookshop, William Robinson Gallery and select book and gallery stores. A limited-edition box set with two newly commissioned etchings by William Robinson as well as an artist- and author-signed copy of the publication is also available.